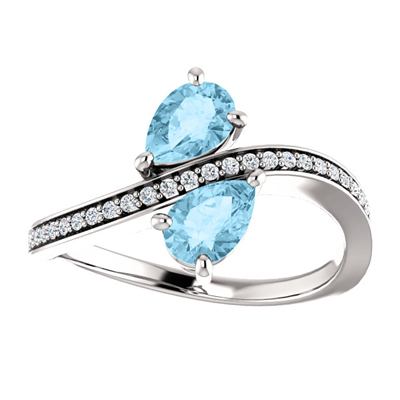 There is a whole lot to love about this pairing of pear cut aquamarine and diamond gemstones set in 14 carat white gold. The two stone ring measure 6mm x 4mm with a total carat weight of 0.13. A polished look to add to any jewelry collection and they make the perfect gift for mom. We guarantee our Pear Cut Aquamarine and Diamond Two Stone Ring in 14K White Gold to be high quality, authentic jewelry, as described above.